Scope R4C는 모든 라이딩 상황에 대응할 수 있는 모델이다. 오르막 코스에 적합할 정도로 가볍고 45mm high rims은 뛰어난 공기 역학 성능을 제공한다. 또한 U-shaped rim은 측풍에도 민감하지 않다. time-trail, sprint, a steep climb 등 모든 상황에서 최적의 성능을 발휘하는 Rim Brake용 모델이다. 2년 전 Scope 2017년 모델 개발에 있어 아래 카본 휠의 주요 특성에서 최고 수준의 benchmark 대상을 지정하여 연구 개발에 착수한다. Scope 2017년 모델들은 위 benchmark 브랜드 휠셋의 각각의 독특한 강점에서 경쟁할 수 있는 수준이다. Brake Performance - 제동 성능의 최적화를 위해서 production partner와 함께 독자적인 resin과 brake pad를 개발한다. 이로 인하여 매우 강한 선형의 그래프를 그리는 제동 성능과 260C의 극도의 고온까지 견디는 성능을 지니게 된다. 또한 우중에서도 안정적인 브레이크 성능을 보인다. Aerodynamics - 준수한 공기역학 성능을 얻기 위해 the Technical university of Eindhoven와 공동연구를 진행하여 최적의 26.2 mm 폭의 U-shape profile rim을 도출하게 된다. Weight and Stiffness - the Technical university of Delft (aerospace engineering)와 공동연구를 통해 무게와 강성을 최적화할 수 있는 carbon lay-up(카본 적층)을 개발한다. Tubeless ready - tubeless ready rim-profile 개발을 위해 Schwalbe와의 긴밀한 협조를 하여 triple-A 등급을 획득한 첫번째 휠셋 제조업체중 하나가 된다. Durability - hub-durability는 제조 공정의 정밀도, 실링 처리, 베어링의 위치와 크기, 베어링의 종류에 의해서 결정된다. 이러한 변수들에 대해 세계 1위 베어링 전문회사인 SKF와 긴밀한 협업을 통해서 독자적인 허브 시스템을 개발하게 된다. 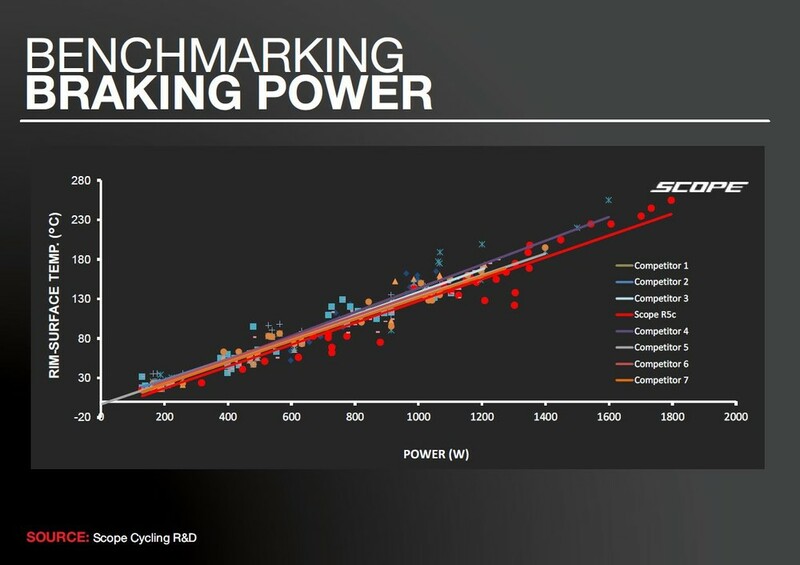 Scope cycling은 이러한 독자 내부 개발 과정을 통해서 위에서 언급한 banchmark 휠셋 브랜드들과 대등한 성능을 발휘하면서도 전체적인 휠셋 성능에서도 최고 수준에 도달한다. Scope wheels은 하나의 시스템으로 조립되는데 이는 허브의 기하학적 구조가 매우 높은 강성을 만드는데 최적화되면서 균일한 spoke tension을 유지하여 가능하다. 허브의 extra wide flange는 wide full carbon rim과 조립되면서 Scope wheels의 측면 강성을 강화시킨다. 이러한 높은 강성은 페달링 파워가 스피드로 전환되게 한다. Scope는 특별한 브레이킹 표면 compound와 brake pad를 개발하여 우중에도 가장 길고 가파른 내리막길에서 자신감있게 내려올 수 있게 한다. Scope가 카본 림에 사용하는 독특한 resin은 260°C까지 견딜 수 있게 한다. 또한 우중에서도 안정적이고 우수한 브레이크 성능을 가진다. Scope disc brake series의 경우는 Center Lock 로터가 체결되어 강력한 제동력을 제공한다. 반복적으로 실행된 Computational Fluid Dynamics(CFD)를 통해 drag와 모든 각도에서의 crosswind 영향을 줄이게 되어 다른 고급 브랜드의 성능을 능가하는 수준에 이른다. Schwalbe와 긴밀한 협업을 통해 개발된 rim의 tire bed는 tubeless tires에 최적화되어 개발되고 또한 모든 clincher tires에 대응되도록 개발되어 26.3mm 외부 폭과 19mm 내부 폭 그리고 넓고 둥근 코 형상을 가지게 된다. 튜브리스 대응 성능을 결정하는 hook bead rim, bead shoulders, deep internal well은 Schwalbe Pro One tires를 이용하여 Schwalbe와 긴밀한 협업으로 개발한다. 따라서, Schwalbe Pro One Tubeless tires (25mm)는 Scope carbon clincher wheelsets의 최상의 성능을 - aerodynamic performance, lower rolling resistance, comfort, safer handling and cornering - 얻을 수 있는 타이어로 가장 추천된다. DT-Swiss 허브를 사용하고자 했던 계획은 측면 강성 개선을 위한 건의가 DT-Swiss로부터 받아들여지지 않음으로 Scope 독자 허브 개발로 전환된다. 이렇게 탄생한 독자 허브는 6-pawl, 36-tooth engagement, SKF bearings (or CeramincSpeed upgrade)을 장착하게 되고 Shimano 또는 Campagnolo cassettes 대응되는 free hub가 존재한다. 기본적으로 tool-free interchangeable end caps이 장착되어 손쉽게 정비를 할 수 있으며 disc wheelsets의 경우는 tool-free interchangeable end caps의 장착으로 QR과 thru-axles standards 모두 대응이 가능하다. CeramicSpeed bearings은 현 시장에서 어떤 베어링보다 더 야무지고 부드럽고 강한 베어링으로 현재 많은 Pro Teams과 professional athletes이 CeramicSpeed bearings를 사용하고 있다. CeramicSpeed products는 보다 빠르고 에너지를 절약하며 다른 시중 베어링보다 3배에서 5배 이상의 수명을 지닌다. 4년의 warranty program을 제공한다. spokes의 압력을 지지할 수 있도록 특별한 직조 패턴을 지닌 carbon lay-up을 spoke holes 주변에 적용한다. 또한, spoke section을 Sapim CX-Ray spokes 보다 다소 강하여 만들어 충돌 사고가 발생할 경우 spoke가 rim보다 먼저 부러지도록 하여 rim을 보존할 수 있어 spokes만을 교체하여 다시 사용할 수 있도록 디자인되어 있다. 2년의 보증 기간과 함께 lifetime crash replacement를 제공한다. 이 교체 서비스는 Scope Wheelset의 첫 구매자가 아니여도 동일하게 적용된다. crash replacement program은 충돌 사고 발생으로 파손된 제품을 특별 할인가에 새로운 제품으로 교환해주는 것으로 하나의 휠에 배송비와 세금을 제외하고 € 450에 교환하게 된다. 동일한 제품이 없을 경우 대등한 제품으로 교환된다. crash replacement 요청이 승인이 나면 최종 교환을 위해서 Scope service center로 교환 휠셋이 보내진다. 교환 휠셋은 2년 보증이 적용되지 않는다. 빠르고 바른 교환 서비스를 위해서 tires, tubes, rim tape, cassettes, skewers, computer magnets 등 모든 부착물은 제거하여 보내야 한다. 초기에 브레이킹 표면에 클리어 코팅이 마모로 분진 발생이 있을 수 있으나 추가로 몇 차례 사용하면서 클리어 코팅이 다하면서 분진 발생은 자연스럽게 사라집니다. 브레이킹에 따른 소음 발생이 있는 경우 토인 세팅 방식(패드 앞부분이 조금더 먼저 브레이크 면에 닿도록 세팅 - 패드 뒷부위에 카드나 두꺼운 종이를 끼워 세팅)을 적용하시면 소음은 전혀 발생하지 않습니다. The Scope R4 is the wheel that can do it all. It’s light enough for serious climbing while the 45 mm high rims provide adequate aerodynamics. 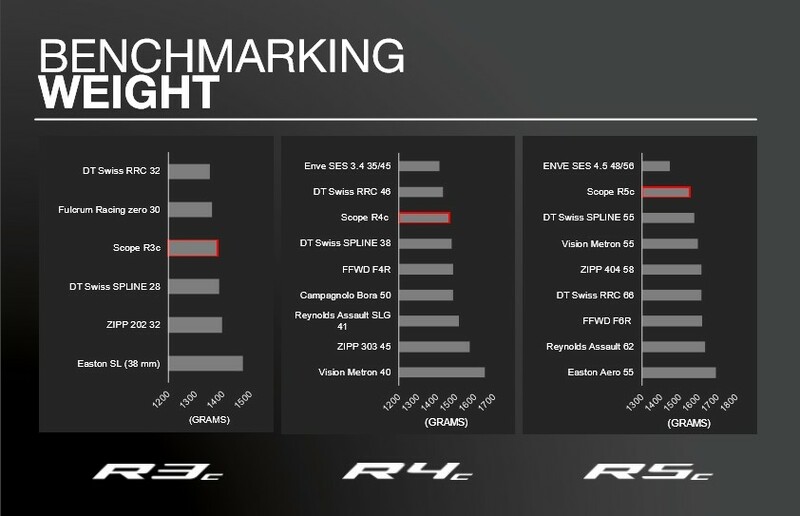 Furthermore, as a result of the shape of the rim the R4 is insensitive to crosswinds. This is the wheel with which you can win a time-trail, bunch sprint, and power through on a steep climb. 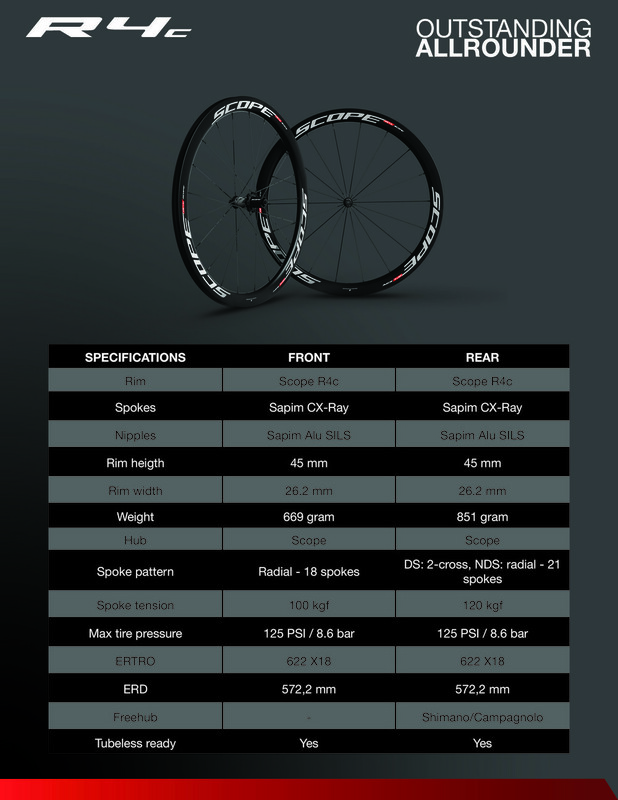 Before Scope cycling started two years ago, with the development of our all new 2017 product range, it have defined the best in benchmark on the following main characteristics of a carbon wheel. It has been its aim to be able to compete with all of the above-mentioned brands, on their own unique competitive strengths. Brake Performance In order to optimize the brake performance, together with our production partner we have developed our own resin and brake pads, which provide a very strong linear and dosable brake performance, and are resistant against extreme temperatures. Aerodynamics In order to reach this quality level, we have partnered with the Technical university of Eindhoven in order to optimize the Aerodynamics of our wheel, resulting in a 26.2 mm width U-shape profile. Weight and Stiffness In addition, we have partnered with the Technical university of Delft (aerospace engineering) in order to optimize the carbon lay-up. Tubeless ready For our tubeless ready rim-profile we have worked closely together with Schwalbe and have become one of the first wheel manufacturers who received a triple-A status from them. 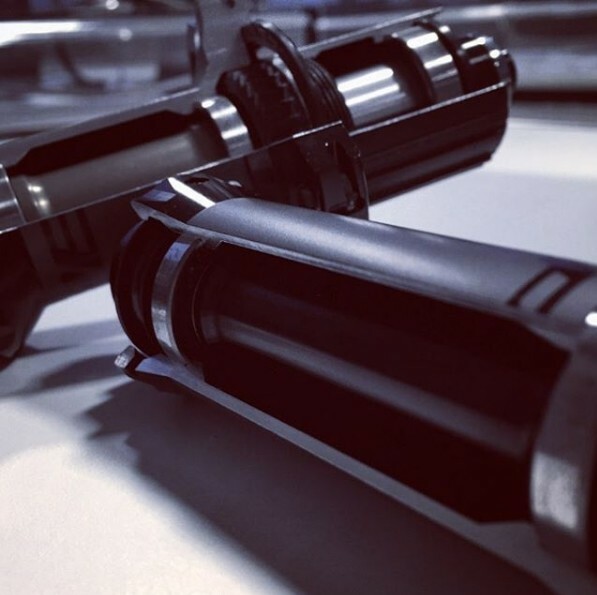 Durability To our perspective hub-durability is caused by the following factors: Accuracy of the production process, sealing, position and size of the bearings, type of bearings. All of these variables have been closely discussed with SKF, resulting in our won hub system. With all these in-house developments, Scope cycling is ensured to be able to compete with all of the above-mentioned brands, and as well claim to have the best overall wheelset available on the market. Scope wheels are built as a system, as a result the geometry of the hubs are optimized to create a very high stiffness while keeping an equal spoke tension. The extra wide flange distance results in combination with wide full carbon rim make the Scope wheels laterally very stiff. 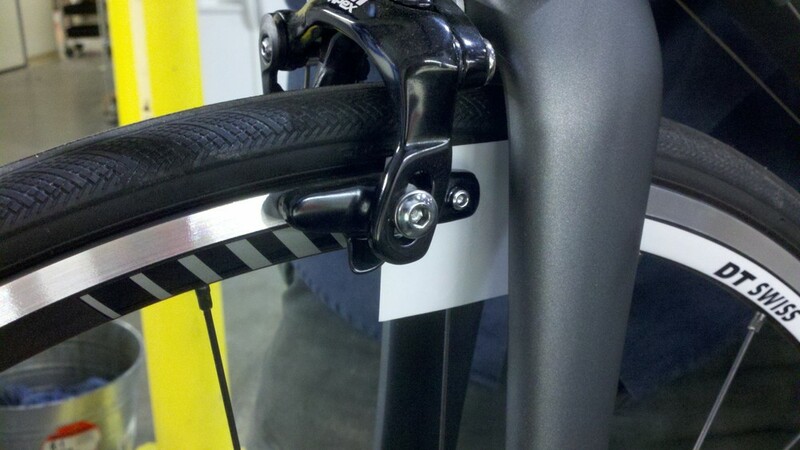 So no more brake rub when pushing your pedals, instead all your energy is converted to speed. Fast wheels mean that you also have to brake hard. For the rim brake series Scope has developed a special braking surface compound and brake pads that are tuned to fit this brake track. Even in rainy conditions you will feel confident in the longest and steepest descents. The unique resin used by Scope in the carbon rims can handle an industry leading high temperature of 260°C. The disc brake series have a Center Lock connection for mounting the rotor. Computational Fluid Dynamics are used iteratively in order to reduce the drag and crosswind influence from all angles, while benchmarking and outperforming other premium brands. 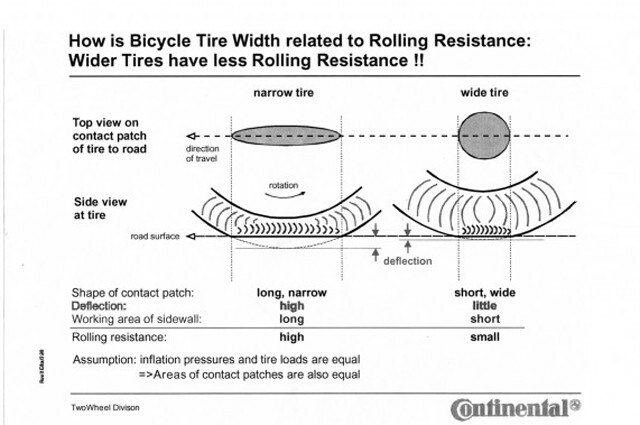 The tire bed of the rim is optimized for tubeless tires while being compatible with all clincher tires. The wheels have the 26.3mm external, 19mm internal rim profile, with a wide blunt-nosed shape. The tubeless performance of the hook bead rim, and its bead shoulders and deep internal well were developed together in close cooperation with Schwalbe by using Schwalbe Pro One tires. So, Schwalbe Pro One Tubeless tires (25mm, when inflated 26mm) are strongly recommended for Scope carbon clincher wheelsets in order to achieve the best performances of wider wheelsets in terms of aerodynamic performance, lower rolling resistance, comfort, safer handling and cornering etc. Hubs use a 6-pawl design with 36-tooth engagement and SKF bearings (or a 500€ CeramincSpeed upgrade), and are available for Shimano or Campagnolo cassettes. 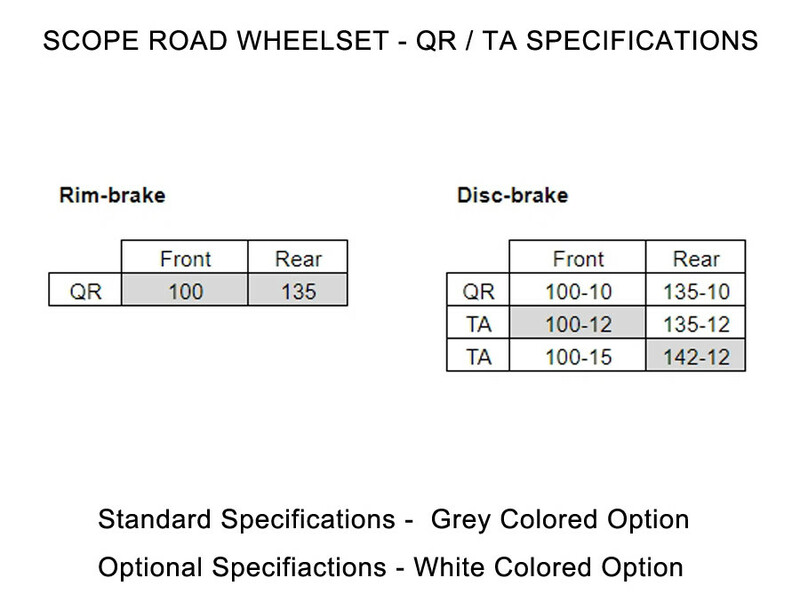 Disc versions get tool-free interchangeable end caps for compatibility with all current QR and thru-axles standards. - SKF is a global No. 1 bearing products manufacturer since 1907. - CeramicSpeed is a ceramic bearing specialized company, introducing high performance ceramic bearings to professional cycling since 2000. CeramicSpeed bearings are harder, smoother and stronger than any other bearings on the market. 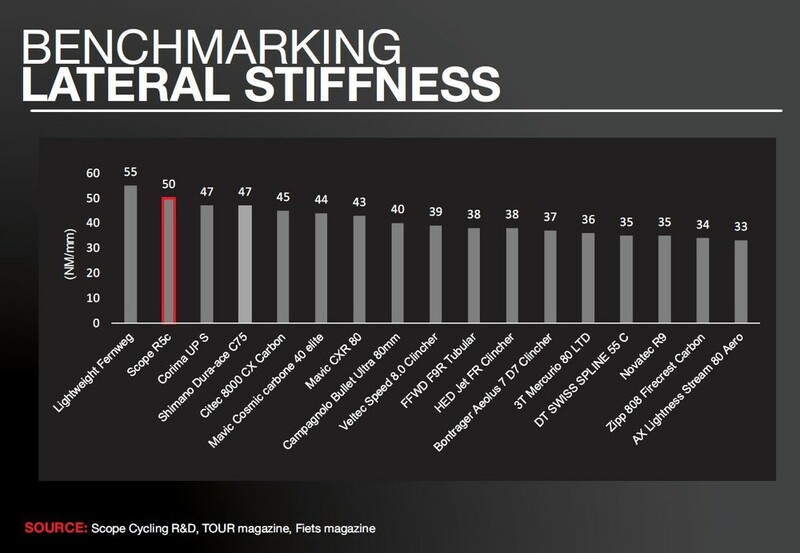 This is why many Pro Teams and professional athletes choose CeramicSpeed bearings. CeramicSpeed products help you ride faster, using less energy, and have a longevity which is 3 to 5 times greater than other bearings on the market. Plus, with the Ceramicspeed warranty program, your bearings are fully covered for 4 years. This is a result of an additional carbon layer with a specific weaving pattern in order to resist the tension from the spokes. Scope made our spoke section just a bit stronger than the Sapim CX-Ray spokes we use, so in case of a crash, first the spoke will break before the rim. As a result, after a crash in most of the cases the rim will still be OK, and by replacing the spokes you will be able to ride our wheel again. In addition to the two year warranty, Scope provides a lifetime crash replacement for all of their products, even in the case that you are not the original buyer of the Scope product. 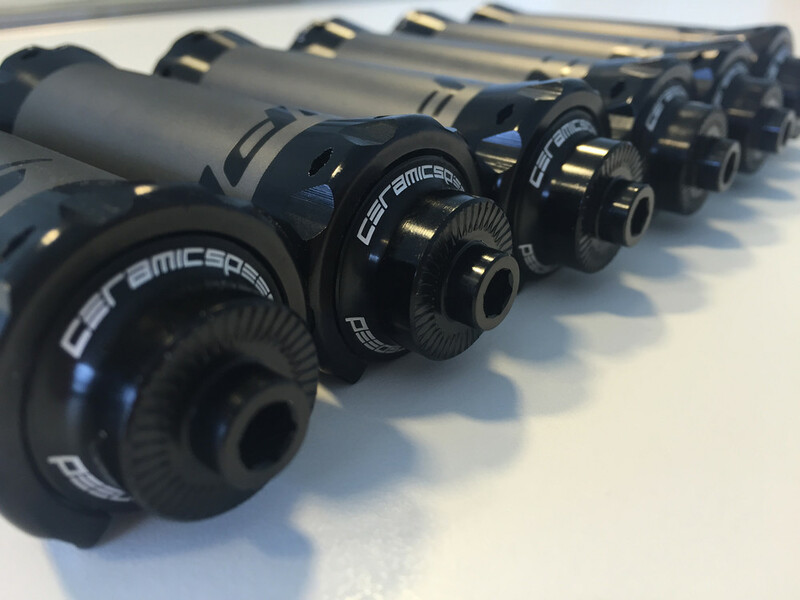 The crash replacement program is an optional service provided by Scope, as a result of which you shall have the opportunity to replace your Scope products in case of a crash with a discount (each one wheel: € 450,- incl. VAT & excl. shipping cost and taxes) on the recommended retail price. If the same model is no longer available, a comparable product may be supplied. After the request for crash replacement officially has been approved, we ask you to ship your product to the Scope service center for final replacement. The replaced product will be supplied excluding the standard two years of Scope warranty. In order to make us able to service your product as quick, and as good as possible, please remove all accessory items, including tires, tubes, rim tape, cassettes, skewers, computer magnets, etc. If you fail to remove these items, we are not responsible if they are lost or damaged, and have to charge you for removing them.